During his 1895–1977 span of years Reid Antony Railton earned the respect and admiration of his peers and was sought after to consult and advise. Thus it should be no surprise that the individual who would take on the task of becoming Railton’s biographer is equally respected in his own right. 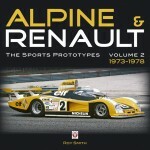 And publisher Evro has done both subject Railton and author Karl Ludvigsen proud with the two-volume boxed set that is, quite simply and in all respects, worthy. If you’re unfamiliar with the name or the man, here’s a super-brief synopsis. Newly minted as an engineer Railton was hired by Leyland Motors Ltd. where early assignments included work on the Leyland Eight and, a bit later, the land speed record car named “Babs.” The next career move found Railton working on his own to design and construct his own vehicle, the Railton. In all something just over 1,000 were built before financial and business realities set in and Railton went to work at Thomson & Taylor as its chief engineer which eventually led to involvement designing world speed competition vehicles; “Blue Bird” for Malcolm Campbell and “Railton Red Lion,” renamed postwar “Railton Mobil Special,” for John Cobb. Later he had a hand in Cobb’s “Crusader.” As the globe erupted with the Second World War, Railton was consulting for Hall-Scott Motor Company in Berkeley, California which gave him the opportunity to relocate to America. Postwar Hudson’s Frank Spring valued his input especially with development of the “stepdown” Hudsons. 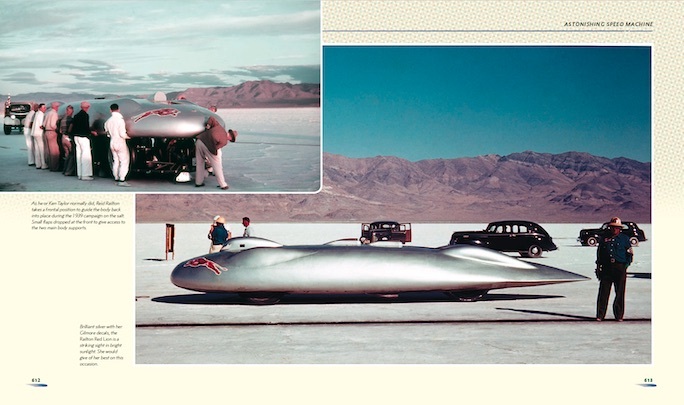 Other consultancies included among others Briggs Cunningham and Donald Campbell, Malcolm’s son who had taken up the gauntlet for world speed records after his father’s New Year’s eve 1948 passing. 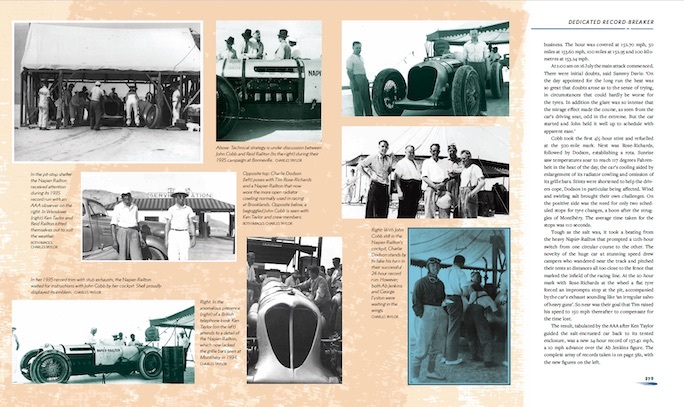 The promo literature for this book notes that very few books explore the lives of people who are engineers, usually focusing on and featuring the more glamorous drivers. That simple sentence immediately brought to mind one brilliant American engineer your reviewer was privileged to become acquainted with in his own last decade named Bill Milliken and whose book, Equations of Motion co-authored with Bev Kimes, is one of the most treasured and oft-consulted on my shelves. So I did what I normally do when first exploring a new book—before immersing myself in the actual text—and turned to the bibliography and index. 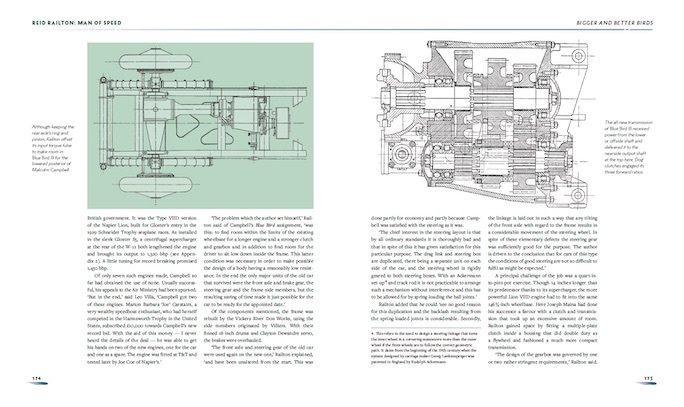 Yep, there was Bill Milliken and even better his son Douglas whom the author of this Railton book had consulted with to help clarify understanding of some of Railton’s more esoteric engineering points. Your commentator has been amused by various attempts to describe the illustrative parts of this book pair. 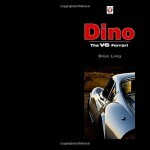 The publisher’s press release indicates 750 illustrations. In some reviews that number suddenly becomes 1000 or even more. One simply wrote “a plethora.” What most fail to tell their reader is the illustrations are a comprehensive and satisfying mix of technical cut-a-way drawings often with photos of the machine or engine on the facing page, the various vehicles shown both static and in motion, and the people in groups or individually, all of which perfectly complement Ludvigsen’s equally satisfying and comprehensive mix of these aspects relevant to his story—technical explanations, historical perspective, narrative of events, and descriptions of the individuals, the people who brought their varied talents and motivations to the story. Knowing its outcome made reading the 23rd of the 26 chapters the most difficult. 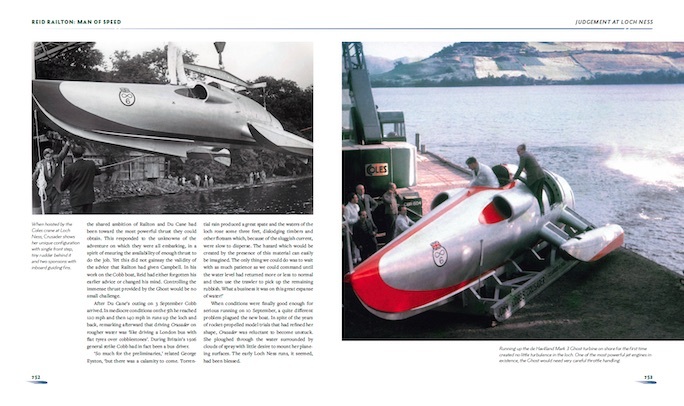 One can only imagine the emotional challenge to research and write as this is the chapter that delineates the construction of John Cobb’s world water-speed record contending boat “Crusader” (below). If you’ve ever witnessed or watched an incident with a catastrophic or sad ending but were powerless to change its course, that feeling is rekindled reading this chapter. Hindsight provides the “woulda, coulda, shoulda’s” but nothing alters the reality of what took place costing John Cobb his life and haunting Railton for the rest of his own days for Railton was a deeply caring person albeit quiet and, in the words of one writer of-the-day “with an appearance and demeanor of a professor of dead languages at a quiet university rather than a designer of ultra fast cars” [and boats –hvh]. Of necessity a book must deal with narrating a person’s life linearly despite that not being how life or events take place for they are almost always intermixed and intermingled. But if the telling were as intermingled, the reader would be thoroughly confused. 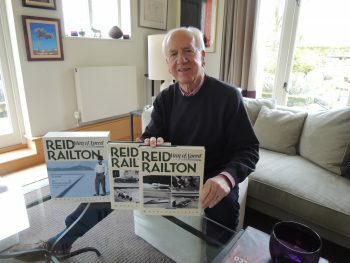 Such is the case with this book on Reid Railton’s life for he was often working simultaneously on various projects that are presented each as a cohesive chapter. Thus your commentator would have welcomed one additional appendix: a timeline that places Railton’s various career activities along it. Author Karl Ludvigsen is no stranger to having his scribings being recognized with awards. 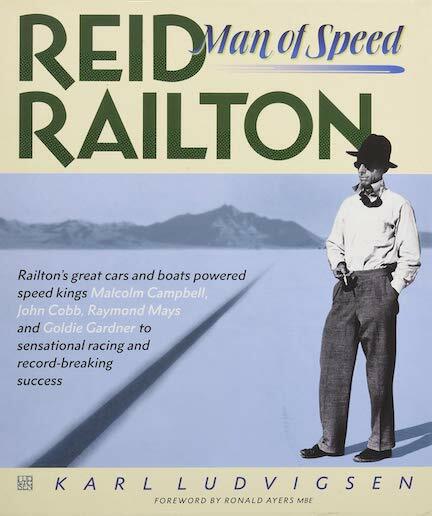 Reid Railton, Man of Speed, is no exception. 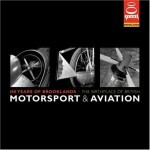 To date, awards it has earned that your commentator is aware of include the Royal Automobile Club naming it its 2018 Specialist Motoring Book of the Year, the Guild of Motoring Writers presenting Ludvigsen with its Lord Montagu Trophy (The Mercedes-Benz Montagu of Beaulieu Trophy for the best recording of the history of motoring in the English language), and the 2018 Michael Sedgwick Award of the British Society of Automotive Historians which recognizes “the author demonstrating excellence in respect of research, writing quality and furthering the understanding of the subject.” Additional ones will surely follow for the book is, quite simply, that good, and as said at the outset, a worthy and enlightening read. Each volume individually indexed, each with three appendices. Bibliography is in second volume. Copyright 2019, Helen V Hutchings (speedreaders.info). Posted Under: Award Winner, Biography/ Autobiography, Technology | Author: Helen Hutchings	| Comments not open.